Decision-making is often seen as only a rational approach to problem solving. As indicated by Mintzberg and Westley, “rational decision-making has a clearly identified process: define > diagnose > design > decide. However, the rational approach turns out to be uncommon” (Mintzberg & Westley, 2001, 89). Often decisions do not emerge from a set of facts, but often erupt from the surrounding context as well as facts. In gestalt terms, we refer to this as figure/ground formation where the point of attention, possibly something unrelated to the situation, suddenly becomes the focus, creating a clarity in not only understanding the situation or problem, but in how to move forward. The question is how to get to this clarity? If we look at the range of problems that require decisions by leaders in organizations, we realize that some decisions are made by thinking about it, others by waiting for clarity to “see” the solution, and others are by “doing” as in experiments and pilot programs. Generally, each person has a preferred approach to making decisions, often, doing so without recognizing that there are other choices and most likely unconscious processes simultaneously occurring. Thinkers tend to rely on the facts and prior proven methods. Often, the thinking is habitualized around prior successes that do not apply sufficiently to the present problem or situation to be valid or effective. To create constructs to address the complexity and size of the problem, the science, facts, and discussions create a pool of ideas of how to formulate a plan of action to solve the problem. A false sense of security permeates the decisions based on past successes. For example, a newly installed, first time, CEO jumped into the new position with enthusiasm. His experiences in prior positions including a stint in the military had created a strong sense of confidence to look to the facts for all the answers. If problems persist, then push people harder, and find more or new data to explain the situation and resolve it. Unfortunately, his understanding of the facts represented only a small aspect of being the CEO. The industry was depressed, the prior CEO had failed to install adequate internal controls leading to unexpected losses, the sales staff was under-developed, and a new sales compensation was established that replaced salary draws without restitution for not making enough sales to cover the draws. A turnover of 45% of the sales force resulted in less than 6 months. Profit margins improved while sales dropped and then stabilized. The CEO focused on an aggressive command and control approach of pushing the organization harder and faster. His micro-managing was so far into the organization that he began to bypass his leadership and go directly into the field with lengthy emails written on Sunday, cutting into the down time of the organization. When his approach was revealed in a leadership meeting, rather than address the approach as something that could be adjusted for more effectiveness, he disengaged from the conversation. If involved anything but what he perceived as the facts, he was not interested. Turning around the organization stalled. Those that rely on seeing for their primary decision-making process tends to be visual and enjoy lots of ideas. Visioning and imagining solutions are a common method of deciding what to do. It is perceived as the art of decision-making. incubation (where the problem is internalized into the unconscious mind and nothing appears externally to be happening). In the incubation stage, we step back from the problem and let our minds contemplate and work it through. Like preparation, incubation can last minutes, weeks, even years. intimation (the creative person gets a ‘feeling’ that a solution is on its way). In the intimation stage, the individual gets a “gut” feeling or precognitive sense that the solution is close. Often, it involves a sense of being “just within one’s grasp”. illumination or insight (where the creative idea bursts forth from its preconscious processing into conscious awareness). In the illumination stage, ideas arise from the mind to provide the basis of a creative response. These ideas can be pieces of the whole or the whole itself, i.e. seeing the entire concept or entity all at once. Unlike the other stages, illumination is often very brief, involving a tremendous rush of insights within a few minutes or hours. verification (where the idea is consciously verified, elaborated, and then applied). In verification, the final stage, one carries out activities to demonstrate whether or not what emerged in illumination satisfies the need and the criteria defined in the preparation stage. Interestingly, in today’s environment, there is a predisposition to think and do rather than allow the creative process to support the decision-making. This predisposition can lead to an over-reliance on the facts and past experiences rather than a larger more systemic solution as seen in the prior example. In the last two decades, several organizations have embraced the emergent insight process more from frustration than desire. Often viewed as a softer approach to the data driven method, Seeing the problem can feel foreign and, if honest, unsafe for some executives as it is not a tangible process that can create a false sense of security like a spreadsheet. The inroad to “seeing” as problem solving has been the speed of disruptive innovation and the attack on existing business practices. For example, a Danish pharmaceutical organization’s business model was set in granite to build upon existing products through a stair-step approach to improving and advancing the product while adding exponential price increases for each annual improvement. Suddenly, the collective market of doctors, patients, insurance, and hospitals began to refuse to use the enhanced products. The prices were viewed as gouging, if not unethical, and earlier versions of the products were viewed as effective and more affordable. The organization is regrouping using the “seeing” approach to reveal what was not seen and what is possible for rebuilding the organization’s focus. Doing first is practiced by those in need of visceral experiences that come from experimentation and pilot projects. Decision-making is viewed as a craft learned over the years. It is a pragmatic approach with the belief that clear thinking for making the decision will follow. Karl Weick advocated such practices in his formula: enact > select > retain. A simpler version would be Do > Pick > Learn. In either formula, it “means doing various things, finding out which among them works, making sense of…[what worked]… and repeating successful behaviors while discarding the rest. (Mintzberg and Westley, 91) Clearly in this case, acting drives thinking. Doers tend to increase the system’s learning because it is trying different processes to determine what solves the problem. The pitfall of doers is to rely on past practices too much instead of trying multiple new ideas that often emerge by integrating seeing with doing. As can be seen from the diagram on the left, each decision-making style has a context wherein it works best as the lead process. Often the problem is solved when the style fits the problem and the organization moves forward. 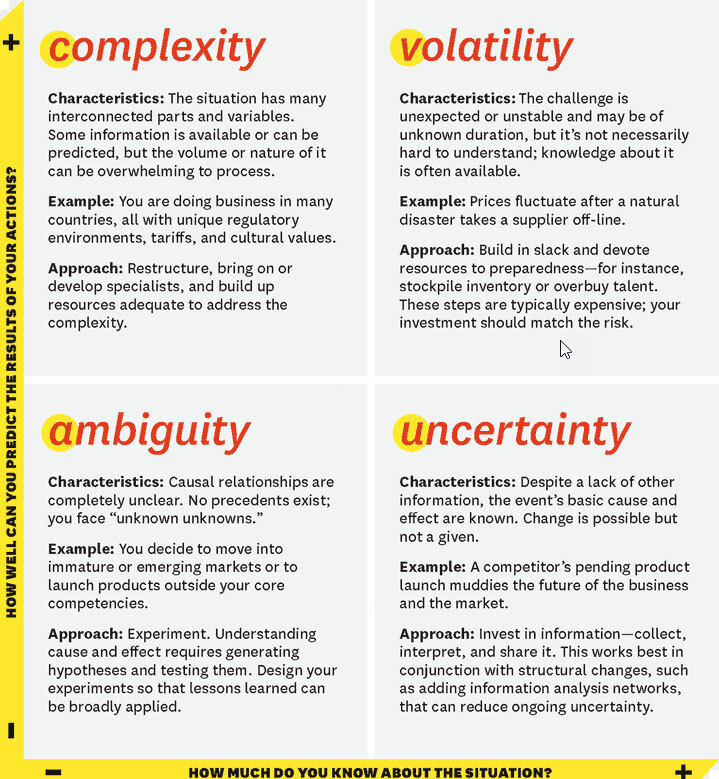 Occasionally, it helps to combine two or even three of the decision-making styles if the problem or situation is volatile, uncertain, complex, and ambiguous. For example, the price drop in oil and natural gas led to a completely unfamiliar situation. Historically, it would be perceived as a glitch in the market which would self-correct over time as supply and demand rebalance and the market corrected itself. Royal Dutch Shell with a long history of “seeing first” through its advanced scenario planning processes realized that the price drop would likely become the new norm for prices. It began a series of processes that involved rethinking its science for breakeven and eventual long-term profitability. Highly disciplined pans were developed for cost cutting and the creation of a new business mode. Similarly, it began to move quickly into “do” mode. Because this context was a completely new business model, it began to experiment with new ideas and processes so that it could thrive at the new price points. Other organizations unable to make such adjustment by staying in the “thinking mode of decision making fell into disarray, insolvency, and/or being absorbed by other larger organizations. They were trapped in their own decision-making process. 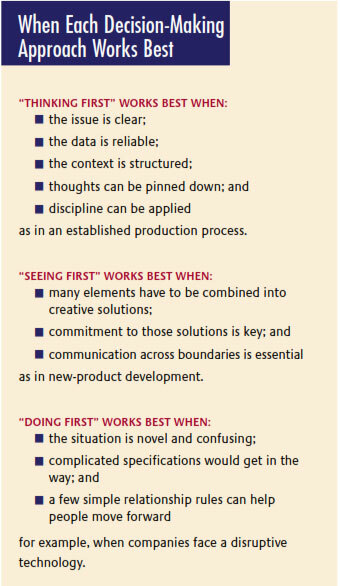 Similarly, some organizations moved into the “do” decision-making process quickly followed by the thinking process. Because the context was beyond any prior experiences or science of the business models being used, these became frustrating exercises in futility. The speed and degree of turbulence in today’s world is unforeseen. As leaders or coaches supporting leaders, paying attention to how decisions are made will be imperative for the next decade or two. The new norm has been coined by the U. S. Army as volatile, uncertain, complex, and ambiguous (VUCA ). Understanding this environment requires a mix of decision-making styles will prove beneficial for those wise enough to apply and blend them. The organization must learn a new way of doing, seeing, and thinking or risk extinction like many organizations have discovered. Table 3, Nathan Bennett & L. James Lemoine, What Vuca Really Means for You. Mintzberg, Henry & Frances Westley, Decision Making: It’s not what you think. (2001) MIT Sloan Management Review, Spring, 89-93. Wallas, Graham (1926). The Art of Thought. New York, NY: Harcourt, Brace & Company. p. 10.